Lladro porcelain pieces are not centuries old, (as other well-known names), but their marks have gone through similar changes and trademarks as even the most famous collectible porcelain makers. 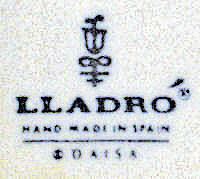 The original Lladro porcelain was created by three brothers; Juan, José and Vicente Lladró, in 1953, in their home in Almàssera, which is in Valencia, Spain. At the time they were working in a tile and crockery factory and their interest in porcelain figurines was a “side” vocation which they pursued using a small “Moorish” furnace built in their new home. By 1955 their artistic talents were creating elegant sculptured figurines, and their interest and desire to create their own porcelain company peaked in 1958 when they decided to do porcelain creations full-time. They moved into a larger warehouse in the nearby town of Tavernes Blanques, and Lladro Porcelain was born as a full-fledged venture. This Lladro figurine – The Valencian Girl is an early example of the appeal of the Lladro brothers talent and style. Noted for subtle pastel color tones, and the unique crystalline finish produced by their innovative one-fire kiln process, the sculpted figurines they produced were unlike those most other porcelain manufacturies produced. Because their early porcelain figurines were influenced by the classical styles of previous porcelain factories like; Capodimonte, Meissen, and Sèvres, they incorporated an image of the Greek “Victory of Samotracia” sculpture as the background for their name, “Porcelanas Lladró”. Note: This was the first company logo – it was not used as a mark on their porcelain pieces! Gloss finish – a high shine finish that is unmistakable from the others due to its high shine. Gloss-finish figurines are the largest portion of Lladro figurine production. Matte finish – a non-shiny finish. (similar to the gloss level of matte-finish photos) Matte-finish figurines are produced in lesser numbers than Gloss. 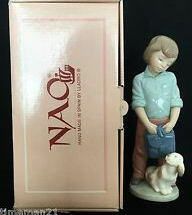 **Many Lladro figurines are produced in both Gloss and Matte finish, (same figurines in different finishes), giving collectors a choice of styles. Gres finish – A Gres finish figurine has a satin-like sheen and is a much more colorful finish. Gres-finish figurines are produced using different methods and clay than Gloss and Matte finish figurines, and generally appeal to a more limited market. As with any collectible market segment, there are some collectors who only buy Gres-finish pieces. *There is some debate about Lladro porcelain marks used between the company formation in 1958 and the first officially listed porcelain mark, which occurred in 1960. These marks have been attributed to pre-1960 Lladro, but it is still a debate because they lack some specific Lladro mark attributes you will see on the marks below. 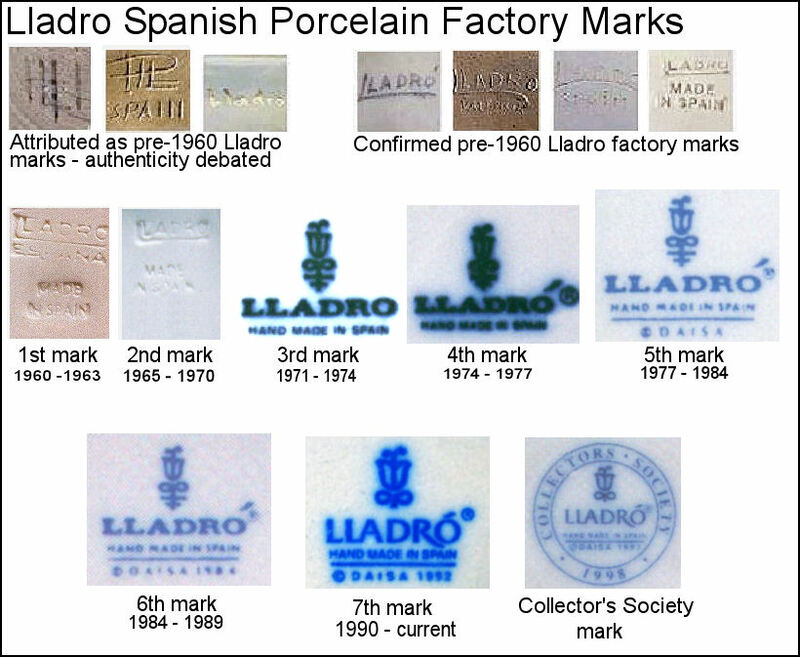 The four marks below are more accepted as authentic pre-1960 Lladro porcelain marks because of their similarities to the first official Lladro factory mark. In each, the first “L” of Lladro has the bottom of the “L” elongated to underline the length of the Lladro name. 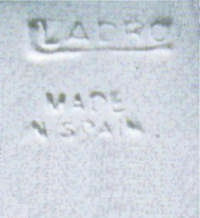 Secondly, the progression of the inclusion of the words “Valencia” to “espanna” to “Made in Spain” seems to lead to the final “Approved” Lladro marking, (see below), that was adopted in 1960. This is the first “Official” Lladro factory mark. It was impressed into the bottom of Lladro figurines from 1960 – 1963. 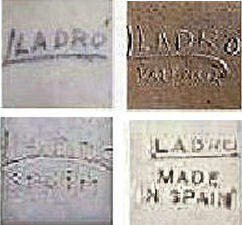 The second Lladro factory mark, used from 1964 – 1970, dropped the “Espanna” from under the Lladro name. It was also impressed into the bottom of Lladro figurines. 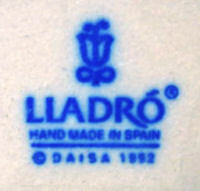 The third Lladro factory mark, used from 1971 – 1974, was the first Lladro use of a blue back-stamp, on the bottom of Lladro figurines, not an impressed mark. The Bellflower, (Tulip), is more intricate than later marks, and the accent mark over the “O” was omitted on purpose. 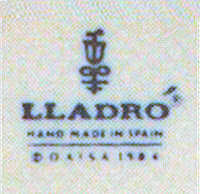 The fourth Lladro factory mark, (also in blue),used from 1974 – 1977, was a correction of the 1971 back-stamp. The accent was added over the “O” and a trademark symbol was included. The fifth Lladro stamp was used from approximately 1977 to 1984. It added the copyright acronym DAISA which stands for Disenos Artisticos E Industriales, S.A. 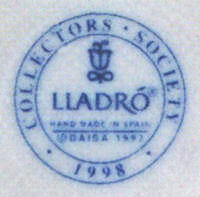 The sixth Lladro stamp was used from approximately 1984 to 1989. It added the copyright date to the DAISA acronym. The seventh, and final Lladro blue back-stamp was created with a different font for the lettering, and the Bellflower was simplified to the “Tulip” design recognized today. This special Lladro factory mark was used for lladro figurines that were designed especially for members of the Lladro Collector’s Society. *You will see references to Lladro DAISA porcelain, but it is not a separate line of Lladro porcelain pieces, it is simply the the name of the Lladró company which holds the intellectual property rights for the figurines. See ALL Lladro Figurines on Amazon now! The true value of collectible porcelains is often different from the values you find on antiques web sites or collector’s price guides. The true value is what similar pieces are actually selling for. As mentioned above, serious collectors and professional appraisers use ebay everyday for value comparisons and availability searches.